Although Mirage is known mostly for their bipolar loudspeakers such as the legendary M1si and their new "Omnipolar" designs such as the OM-7 and OM-5, they are actually part of a larger company, Audio Products International. 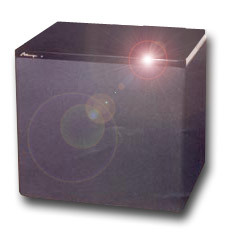 API also manufactures loudspeakers under the Energy, Sound Dynamics, and now Athena Technologies brand names. Ian Paisley, who is vice president of engineering at API, oversees product development for all of APIs product lines. However, he still maintains his title as head designer for Mirage. A respected, longtime speaker designer, Paisley is considered by many to be a pioneer of bipolar and now Omnipolar designs. Thus, when I went to see Paisley, who was visiting a dealer in Vancouver to demo prototypes of two new speakers back in November of 1998, it took me by surprise that both speakers were fairly conventional, direct-radiating designs. These two prototypes both sounded very promising even in the rather small listening room in which they were being demonstrated. The minimonitor that he had with him was the MRM-1, which was reviewed by Doug Schneider in the February 2000 issue of SoundStage!. The home-theater package that he had there was the HDT (High Definition Theater) speaker system, which is the subject of this review. I later learned that Andrew Welker, who did much of the design work on the MRM-1, was also the principal design engineer for the HDT system. The result is a more conventional design, which is a departure from Mirages usual bipolar/Omnipolar approach to high-performance speakers. The Mirage HDT speaker system consists of three HDT-F front and two HDT-R surround loudspeakers. Although Mirage does not have a subwoofer specifically designed for use with the HDT system, they provided one of their BPS-400 subs along with an LFX-3 three-channel external crossover for this review. Price: $1300 USD each, 110 lbs. Bookshelf acoustic suspension design (HDT-F and HDT-R). Pure Titanium Hybrid tweeters and midrange drivers (HDT-F and HDT-R). Available finishes: black ash and cherry wood for HDT-F, white and black for HDT-R.
LFX-3 crossover: three-channel operation and mixing of center with left/right channels. The HDT-F may be a direct-radiating loudspeaker, but its design is anything but simple. It is a three-way bookshelf design that utilizes five drivers. They consist of two 6.5" polypropylene, carbon-graphite- and mica-injected bass drivers, a 1" tweeter described as a "Pure Titanium Hybrid" (PTH) design (which has descended from the Mirage M1si) and two 1.5" PTH midrange drivers. The tweeter and two midrange drivers are situated diagonally across the center of the front baffle, so that they are always oriented in the same fashion whether the speaker is placed vertically or horizontally. The two bass drivers flank the tweeter and midranges in a dual DAppolito configuration. The HDT-F is an acoustic-suspension design, meaning it utilizes a sealed enclosure with no ports. Frequency response is rated from 60Hz to 20kHz with a sensitivity of 90dB and 6-ohm impedance. The HDT-F features three switches on its front baffle, which are used for equalization of the treble, midband and midbass frequencies. These enable you to optimize the speaker for each installation. The speakers are bi-ampable and bi-wirable with heavy-duty, gold-plated five-way binding posts. The speakers are available in black-ash or cherry-wood veneers with a removable front grille. The HDT-R surround speaker is said to be an Omnipolar design, meaning it is designed to radiate sound in all directions. At the demonstration I attended in Vancouver, Paisley described the speakers dispersion pattern as actually being more like half of a grapefruit (presumably when the speaker is mounted on a wall). The HDT-R is trapezoidal in shape with two 5.5" bass drivers on the front baffle that are slightly smaller than those utilized in the HDT-F and which fire directly into the room. Each side baffle, which is directed at an angle into the room, has the same PTH midrange driver and tweeter as the HDT-F, for a total of six drivers. Frequency response is rated from 80 to 20,000Hz with a sensitivity of 90dB and 6-ohm impedance. The HDT-R is also bi-wirable and bi-ampable like the HDT-F with the same high-quality binding posts. It, too, is an acoustic-suspension design and is available in black or white finishes. Weighing in at 110 pounds, the BPS-400 is a very large, powered bipolar subwoofer utilizing two 12" drivers and a 250W amplifier. It has a frequency response rated down to 18Hz. It is finished with an attractive, black piano-gloss top with removable cloth grilles on each side. It features a basic crossover with a low-pass filter that is continuously variable from 50Hz to 100Hz. There are three line-level inputs: the standard left and right as well as an "LFX" input, which bypasses the internal crossover and level controls for use with an external crossover such as the LFX-3. Note that there are no provisions for a high-pass-filter output or a high-level (speaker) input, nor can the phase be inverted. As such, the BPS-400 is intended to be used with an external crossover or driven by the LFE output of a surround processor. The BPS-400 also features an auto-sensing on/off circuit that cannot be overridden. The LFX-3 is an external crossover with a twist. Not only will it allow you to blend three front channels (instead of the usual two) with one, two or even three subwoofers, but it will also allow you to mix the center-channel signal into the left and right channels. This allows the option of having a real center-channel signal, phantom center-channel signal or anything in between. The high-pass filter can be set at 50, 63, 80 or 100Hz for the mains and/or the center channel. The slope of both can also be altered to further allow for better integration with the subwoofer. Unfortunately, phase is not continuously variable and can only be inverted by 180 degrees. A bypass mode is also provided to allow for full-range signals to pass through the LFX-3 to the speakers. When the Mirage HDT system first arrived, I broke the speakers in for several days with some two-channel music, the XLO Test and Burn-In CD, and when the temptation became too great, I even watched a few DVDs to break-in the center-channel and the surrounds. I configured the system with the LFX-3 distributing the bass from the front three channels to the BPS-400. After some experimentation, I settled on a crossover point of 63Hz and was able to get a reasonably flat response from 100Hz down to 20Hz. I also experimented with blending the center channel with the left and right. I preferred the control set at what appeared to be about one-quarter of the center-channel signal sent to the left and right channels in order to obtain what I thought was a nice stereo effect. For home theater, I augmented the system with either a Sunfire True Subwoofer or a Paradigm PW-2200 for the LFE channel. When I first listened to music on the HDT-Fs, I was surprised at how much the sound resembled that of my reference two-channel speakers. Of course, the lower registers were missing, but in some ways I actually preferred the sound of the HDT-Fs to that of my Infinity Compositions Preludes. 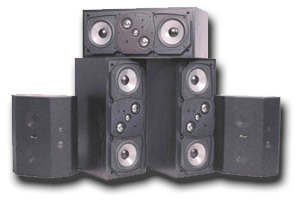 These were not simply home-theater speakers that sounded good with music, the HDT-Fs were true music transducers. For instance, "Frim Fram Sauce" from Diana Kralls All For You [Justin Time JTR 8458-2] was nearly perfect. Her voice was satisfactorily sweet, clean and powerful, and every little strum and tiny bit of distortion was evident from Russell Malones electric guitar. Other cuts such as the swinging "Hit That Jive Jack" exhibited excellent pace and had me tapping my toes in time to the music. The flute on Robbie Robertsons "Vanishing Breed" from Music For the Native American [Capitol C2 724382829522], which can give lesser speakers fits, was reproduced at high levels and without strain. DTS CDs such as the Mavericks Trampoline [MCA DTS 1015] and Stings Ten Summoners Tales [A&M 71021-51052-2-2] really benefited from the exceptionally high caliber of sound coming from the identical front-speaker array and the well-matched surrounds. The BPS-400 may not be the last word in subterranean bass, but at $1300 it should not be expected to be. When playing back CDs with deep, extended bass such as Jennifer Warnes The Hunter [Attic ACD 1344], there was some overhang and lack of definition, but there was never any lack of low-frequency extension or sound-pressure levels. The Mirage sub energized the entire room with an authority that can only be found with very good, very large subs. The LFX-3 crossover, much to its credit, did not seem to add any sonic signature of its own to the sound. The three EQ switches provided on the front baffle of the HDT-Fs are meant to adjust the speakers response to various rooms and installations. Although the effects of the EQ were subtle, I found that both the midband and treble EQs most noticeable effect to be on imaging. With the midrange and treble boost off, the imaging was slightly indistinct, whereas it tended to snap into focus when the boost was activated. However, I found the treble boost to make most movie soundtracks a bit too bright and preferred to watch movies with only the midband boost on. In contrast, I preferred to listen to stereo recordings with both the midband and treble boost engaged because the brightness was not as pronounced and I enjoyed the more precise imaging. The midbass EQ, which is specifically designed to prevent boominess when the speakers are flush-mounted, did not seem to have any effect in my setup of the HDT system, so I left the switches on the "Free Space" setting. Getting called up to "The Show"
Once I got the break-in and my preliminary music listening out of the way, I utilized the HDT system for what it was designed for -- movies. To say that the Mirage HDT system did a good job of reproducing movie soundtracks would be an understatement. I received some of the most satisfying, coherent and dynamic home-theater sound that I have ever experienced from this system. The opening credits of Austin Powers: The Spy Who Shagged Me, which are the perfect combination of music, foley effects, and dialogue, were a delight to listen to on the HDT system. Not only was the music wonderfully reproduced, but also foley effects and dialogue were perfectly placed across the front soundstage. Even very low-level dialogue was intelligible. In the next scene (Chapter 3: "My Father is Evil and Wants to Take Over the World"), radio chatter in the control room from the rear channels was easily intelligible and the surround effect was exceptionally spacious. The Sweet Hereafters music score, with its haunting strings and wind instruments, was smooth yet forceful, and there was excellent pitch and definition to the thunderous drum whacks just prior to the bus crash in Chapter 11: "That Morning." There was also precise delineation of the interior of Hill House in The Haunting, with creaks and wind noise coming from all directions, and deep, ominous bass filling the room. The slight overhang and slowness to the bass that was evident on two-channel recordings was nowhere to be heard on multichannel movie soundtracks. So what do you really get with the Mirage HDT speaker system? Well, reference-quality home-theater and stereo sound for one price. Individual instruments, voices and effects sound natural and image very well across the front soundstage, with excellent depth and surprisingly good dynamics on both music and movie soundtracks. The Omnipolar surrounds are able to create a totally immersive surround ambiance but can also localize effects when required. If pressed to describe the sound of the HDT system, I would have to say that it is a tad on the dark side (although, almost imperceptibly so), but this is not necessarily a bad thing, especially when listening to movie soundtracks which are often overly bright. There is also the added bonus of flexibility in placement. Because these are bookshelf speakers (albeit very large bookshelf speakers) with sealed enclosures, they are much less sensitive to placement near room boundaries than ported speakers or speakers with large side-firing woofers. Mirage even states in their comprehensive owners manual that the HDT speakers can be placed in walls or other custom enclosures. I cannot stress enough how well the Mirage HDT speaker system was able to reproduce both music and movie soundtracks, but at a cost of just under $8000 (including the crossover and subwoofer) you should not expect anything less. In some ways, I even preferred the sound of the HDT-Fs to my $3900 Infinity speakers for stereo recordings. While they could not throw as big a soundstage as the Infinitys, their transparency and fast dynamics provided a sound that was different, but equally as satisfying. On movie soundtracks the HDT system was able to create a totally coherent 360-degree sound experience that was one of the best that I have ever heard. Although I have actually heard better home-theater speaker systems, most if not all of them have been based upon much larger and much more expensive, full-range speakers. In terms of form and function, the Mirage HDT system reminds me of something like the B&W Matrix Home Cinema Series, which was one of the first and is in my mind still one of the best home-theater speaker systems around. At a cost of nearly $8000, the Mirage HDT system faces stiff competition from speaker systems by such heavy hitters in the industry as NHT, M&K, B&W and Dunlavy, just to name a few. Also, at this price point, it is possible to piece together a system around some very good, full-range loudspeakers. However, the HDT system has the advantage of utilizing identical left, center and right speakers as well as the very well-matched Omnipolar surrounds, all of which are very easy to place due to their relatively compact size and acoustic-suspension design. The Mirage HDT speaker system may not be a grand slam home run (very few products are), but it is definitely a game winner. What really enamored me to this system was its excellent performance on music, whether two-channel or multichannel recordings. And, of course, its reproduction of movie soundtracks was even more impressive. The speakers handled everything that I threw at them with ease.